Seen and immediately knew that we fit together and with each other. Trust and lots of laughter, many wonderful conversations. Kerstin is a learning coach and manages to ignite ideas with empathy and patience. Trust, appreciation, friendship, giving and receiving, love, listening, talking, feeling good, music and singing, learning with joy, solutions, searching and finding … And the common path continues. Micaela has traveled half the world as a supportive expat wife who has managed to find her way. Now she helps other expat partners to find happiness far away from home. 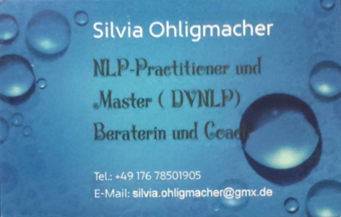 My NLP training started together with Silvia. Together we got to know our strengths, abilities and values, but also our weaknesses and fears. I had many of them on my way to becoming trainer and coach. Silvia believed in me and always encouraged me to move on. She is a coach to me with so much empathy, appreciation and an inner desire to help people and to believe in themselves. The photos of me on this website were taken in the rooms of the Synapsenschmiede. Thank you – to both of you – again for that. Here I wish that in one way or another there is still a common way. Numbers, facts & figures and so much heart and humor with honesty and trust. Thilo calms down heated discussions and brings me back to the floor, just to motivate me to reach for the stars. I’ve rarely seen lectures on data security policies with as much fun and humor as from Thilo. “We do not coach our friends” … and yet I go home after deep and trusting conversations with Thomas and suddenly ask myself questions that I have not asked myself before. I look at things that I did not know before that there actually is this angle. For me he lives Design Thinking and the cross thinking.